I took the girls to lunch yesterday. They chose Taco Bell. Allie’s cousin (or BFFIF – Best Friend Forever in Family) was with us to meet the youth group from church at a local water park. As we were enjoying fine dining, I searched my cavernous bag for my phone and couldn’t find it. I asked Allie to call it but her phone was my car. I decided I must have left it at home. When we got back in the car, I again asked my daughter to call my number. Nothing. Must be at home. I turned the car toward the water park so the girls wouldn’t be late. Within a minute, I got another phone call. And it came through my car’s bluetooth speakers. Huh. It must be in the car somewhere. So as we continue to drive I hand my purse back to Allie and ask her to empty it’s contents. She did not find it. So I ask her to call my phone again. Nothing. It takes a few minutes for my brain to sort this out, but it ssslllooowwwlllyy starts to dawn on me that I had put the phone on top of the car when buckling Shelby in and left it there. It dutifully stayed on top at slow speeds on the way to cheap Mexican and for a couple of minutes after we left, but spread it’s wings at some point after that. I began to panic, but at this point was half way to the water park and wanted the girls to be on time. I asked Allie to pull up Find My Iphone on her device. She handed it to me and to my horror, it mapped to the entrance ramp for State Highway 121 by our lunch dining establishment. The words running through my mind were NSFK, so I TRIED to remain calm as I maneuvered the girls to their afternoon fun. In my flustration (yes, I think that’s a word), I made several wrong turns, thus increasing my anxiety and the number of sharp interactions with my poor – and in this instance completely innocent- daughter. We arrived at the waterpark and I commandeered Allie’s phone to use as a tracking device for mine, and dropped the tweens with the church youth group for some fun. Driving like something out of the Fast and Furious franchise, I turned around and made my way back toward my mini computer. I wish I could say I was not panicked by this loss, but at this point most of us pay hundreds of dollars for these gadgets and store much of our life on them. And having no land line, its the only tele I have. Ok, enough justifying my state of mind. It took me about 30 minutes to get back to the spot where my phone was located. I had to stop in parking lots a couple of times on the way to change settings on Allie’s phone because, like a good pre-teen, she has location services turned off. I finally made my way to the access ramp for the highway and inched up onto it, trying to watch for my phone, while being very aware that cars behind me were trying to accelerate to merge with traffic. 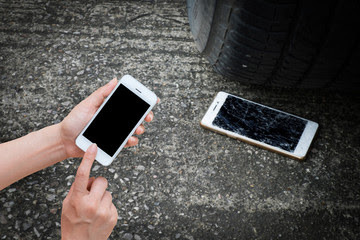 I also nursed a pretty healthy fear that even though I could assume my phone was in some kind of working condition since it was located by the app, there was a possibility that someone could run over it at any time – including me. I drove slowly up to the on-ramp and down the first lane of highway looking for the phone and in front of me for other cars, but did not see it. I got off at the nearest exit, make the block and came back to the on-ramp. I drove slowly again but decided quickly that I was going to have to pull over off the road and walk the shoulder to find it. Did I mention yet that my daughter Shelby, who has special needs, was also in the car? I looked quickly to the side of the road, but there is hardly any shoulder on the ramp and shortly thereafter. I needed to pull forward about 100 yards to have enough room to safely park and exit the vehicle. So then I made the uneasy decision to leave Shelby in the car with the engine on since it was over 95 degrees. Thanks Texas summer. I trucked as fast as my legs could carry me, since I was burning up and worried about Shelby, back in the direction of the highway entrance. Well, I wasn’t running because first, no one was chasing me, and second, because I had to look feverishly for anything shiny while also watching for fast approaching vehicles and traipsing through knee-high median grass.